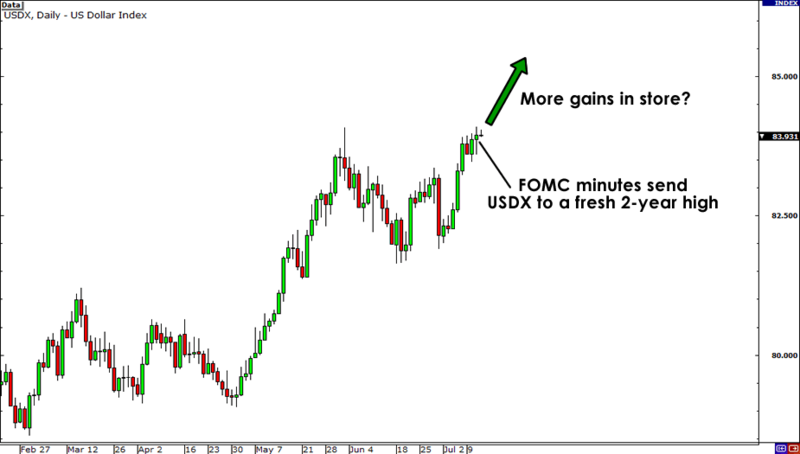 The dollar index soared to a new 2-year high on Wednesday after the Federal Open Market Committee (FOMC) had left QE3 hopefuls disappointed once again. The index tapped a high of 89.093 as the dollar ended the day higher against most of its major counterparts. Back in June, the markets rallied at the expense of the dollar as investors anticipated the need for QE3. But I can’t help but wonder if these gains will all be undone now that the Fed has settled for a mere extension of Operation Twist and appears to be moving away from further easing. But before we get down and dirty with the nitty-gritty details of the minutes, let’s do a quick recap of what happened in the FOMC’s June 19-20 meeting. In its last FOMC statement, many were disappointed that the Fed didn’t announce QE3 and instead just went with an extension of its Operation Twist program. Still, policymakers didn’t exactly leave the markets empty handed. They gave investors hope for more stimulus down the line as the central bank’s growth, inflation, and unemployment forecasts were all revised for the worse. Hence, people had reason to believe that QE3 was still a possibility. However, the minutes of the latest meeting reveal that the Fed may actually be shying away from more stimulus. Surprising at it may sound, it appears as though central bankers are expecting the economy to pick up steam over the coming months! While two out of the 12 voting members of the FOMC have hinted that they’re ready to pull the QE trigger once more, two others indicated that such a move would only be needed if employment conditions do not get better or if the economy faces more headwinds. Right now, though the Federal Reserve recognizes the risks to the global economy posed by the European debt crisis, it still believes that the U.S. economy isn’t in immediate danger. According to the minutes, the FOMC is content with its extension of the Operation Twist program. Heck, the committee even described the risk of further economic deterioration as being “low at present.” How’s that for confidence, eh? One thing you should note though is that the FOMC minutes were based on the meeting back in June, before the release of highly concerning manufacturing, non-manufacturing, and employment data. It’ll be interesting to see if the policymakers’ stances have changed after seeing these weak reports. After all, they do present solid arguments for more easing. In any case, we’ll know on August 1, when the FOMC is due to hold its next meeting. Sit tight, forex fanatics! This QE3 drama ain’t over yet! Will the recent string of weak U.S. reports push the FOMC closer to QE3?